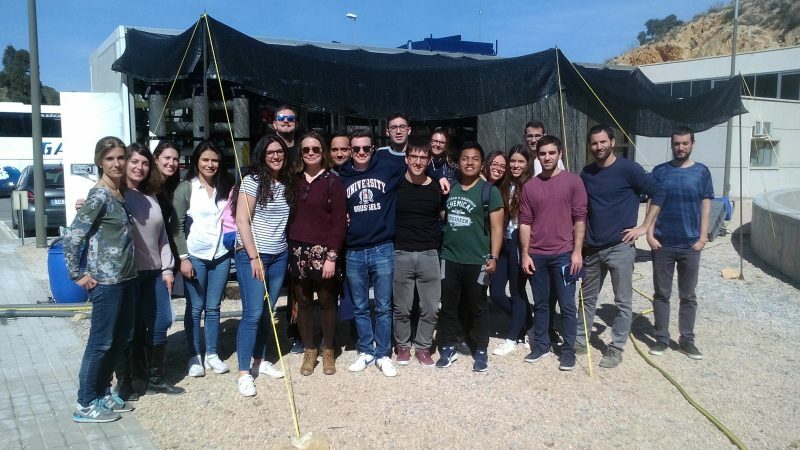 On February 28th, students from the Higher Polytechnic School of the University of Alicante (EPS Alicante) and the University Institute of Water and Environmental Sciences (IUACA) visited the LIFE EMPORE pilot plant, as well as the tertiary treatment facilities of the Benidorm WWTP. These initiatives were attended by students who are studying various degrees, such as; ‘Chemical Engineering’ and the ‘Master in Water Technologies and Environmental Sciences’. The visit, organized within the Cultural Month of the EPS, was aimed at magnifying the problem of emerging pollutants, allowing students to expand their knowledge on this topic. During the visit, representatives of the partnering projects explained what LIFE EMPORE is all about. Silvia Oyonarte of AIDIMME and María de los Ángeles Bernal, member of IUACA, gave a presentation about the project and its objectives. They highlighted aspects such as the characterization of effluent and emerging pollutants that have a sizable concentration. During the presentation, the methodologies used for the demonstrator were explained, as well as the process of the demonstrator for completing the design, construction and installation. Javier Andreu, from CONSOMAR S.A, was in charge of showing how the automation process of the pilot plant has developed. Also, students from the EPS and the IUACA saw the demonstrator live in action and the equipment that is used for the different treatments: pre-cleaning, ultrafiltration, reverse osmosis, advanced oxidation, electrochemical processes and carbon adsorption activated. After learning about the LIFE EMPORE project and seeing the pilot plant in action, the students visited the Reclaimed Water Regeneration Facility (IRAD) in Benidorm. In this installation, the purified effluent from the WWTP of Benidorm is treated through a system of ultrafiltration and reverse osmosis membranes. EMPORE (ref. LIFE15 ENV/ES/000598) is co-financied by LIFE+2015 Call, The LIFE Programme is the EU’s funding instrument for environment and climate action. The project is due to last 36 months, with a total budget of 1.783.824€.